…those little idiosyncrasies, habits, obsessions. We’ve somewhat solved the problem of a wet floor by placing her bowl inside a larger plastic water bowl, the type made for dogs. What is this? Are you soaking in preparation for a pedicure? And that’s just very unappetizing to be drinking water while you’re standing in it. It’s rather obvious, after looking at this next picture, that should you ever decide to soak your hind feet, we’ll need to buy you a washtub…. 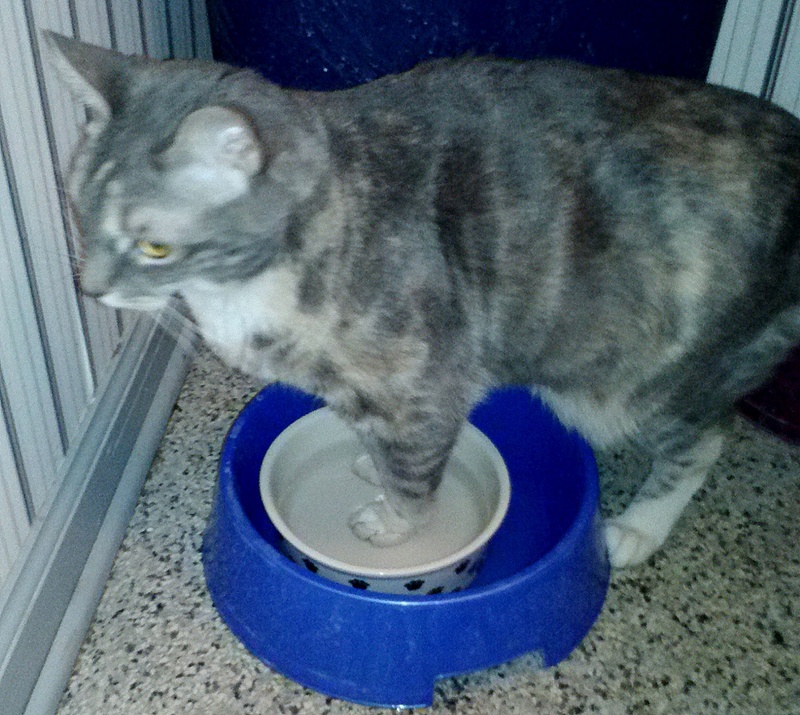 This entry was posted in Gypsy and tagged cat playing in water, tabby cat. Bookmark the permalink. Isn’t that funny! Well, she obviously feels the need to have clean “hands” but without access to a sink the next best thing is her water bowl! HAHAHA That’s cute…….you’re right about those back toesies though – should she decide she needs to wash those she’ll need a much bigger “container” !! Geez, Mom, don’t you wash your hands before you eat?! How cute! Berkley used to refuse to drink his water if it wasn’t cold enough in the summer. He would sniff it and if not to his satisfaction, he’d head for the toilet. I found myself having to put ice in his bowl to keep him happy! Oh Gypsy! You brighten up my day!! So adorable! Dianna that is too too funny!!! Maybe Gypsy was hangin’ with a raccoon when she was a baby and learned to wash her hands.. um, paws before and after meals. I know some cats love to play in water but I think Gypsy REALLY loves water! Cute post! That was smart to put the smaller bowl in the larger one. T-Bob is very particular about his water. It has to be fresh and can’t have so much as a floaty speck of anything in it. Honestly, I feel compelled to water the plants with the rejected non-fresh bowls of water. Have a great day. Buddy LOVES water as well and is always playing in the water fountain I have for them. I have a mat underneath the fountain as well for them because the floor is always wet around it just like what Gypsy does. I have never seen him actually standing in it like Gyspy, though! Cats. Strange, right?? REALLY??? And we grew up thinking that cats hated water, except to drink. Just too CUTE!!! LOL! 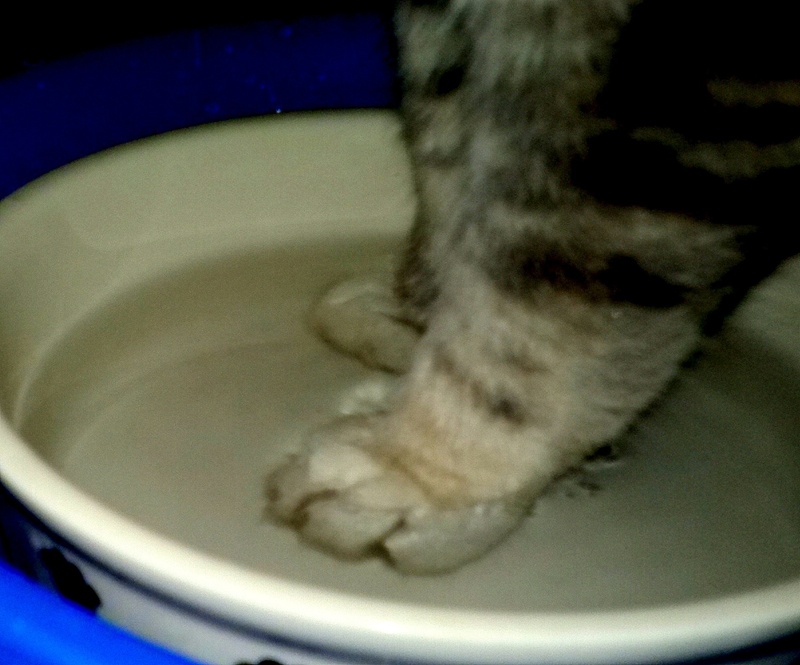 I have a cat that is fascinated with water, too … but he has never done that (to my knowledge). One of her ‘things’, I guess !! made me bust out laughing!!! Who knows the mind of a cat! Gypsy-girl , you’re one of a kind!! I had a cat for about 3 years, and she was the most peculiar thing you’d ever seen. 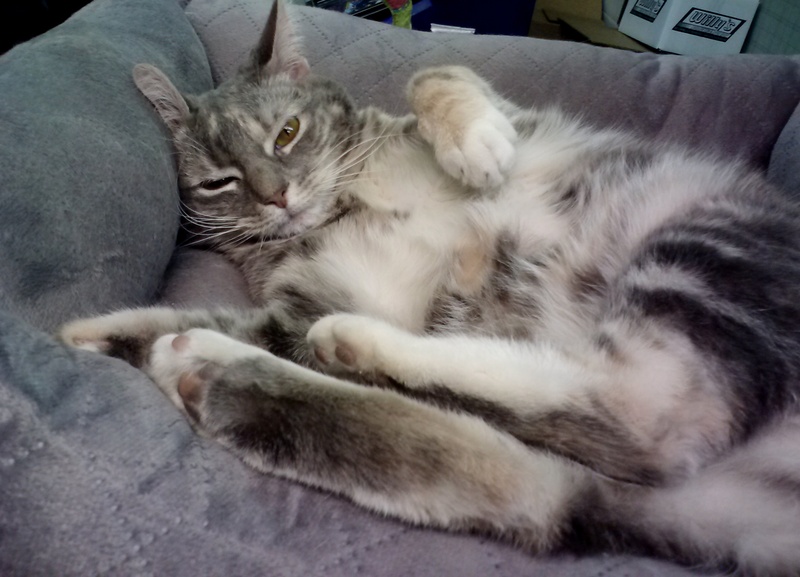 She had no teeth (we never knew why), was very skittish, and instead of meowing, she merely squeaked. I wouldn’t have traded her for any ‘status quo’ cat out there. She only washes the ones she eats with. 😉 My daughter had a cat that was attracted to the bathroom when the shower was running. I’m new to social network blogging and so I am participating in Blogging 101 and todays assignment was to use 5 new topics to find 5 new bloggers to follow. You came up under gypsy. I enjoyed your stories so I would like to follow you. What a trip Gypsy is! She knows what she likes! Gypsy has a mind of her own. She looks like she enjoys the water. Like Dorannrule I had always thought that cats disliked it. Oh that is funny. 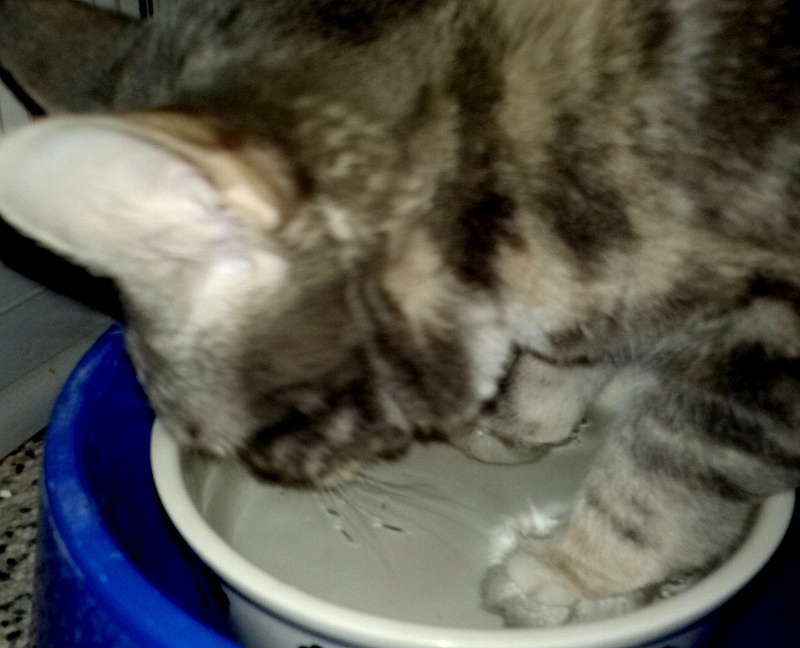 One of our cats plays in the water and sloshes it out of the water tub all ove the counter. Wowzers! Mes wonders if she likes to swim? PS – Jo Jo stands in the river like that to drink in the summer!